As a musician, performer, DJ and social maverick, Joyride has entrenched himself as one of the biggest personalities in Australian music. His work with the One Day Crew and The Meeting Tree has seen him nominated for an ARIA and play some of the biggest events in the country – from major festivals like Splendour In The Grass to the immensely popular One Day Sunday block parties. 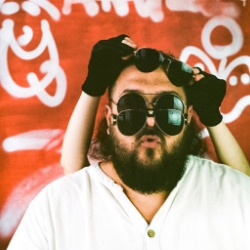 As one of the most loved members of the Australian music community, Joyride is a dedicated artist, widely recognized for his talent, quick wit and off-the-cuff humour (see: any interview he’s ever done) and compelling live performances.